Back to The Bouqs Co.
We decided to use The Bouqs in order to cut costs. It was a huge savings, the flowers that came were beautiful, and what we received was way more than what we expected. We ended up being able to make so much more than what we originally ordered for! There was a small miscommunication about getting petals, but since we had extra flowers it was not an issue at all. Totally worth it if you have time to put your own flowers together and the space to store them. I did a DIY package for my bouquets and I am so glad 8k went with this company. They were very responsive and they tell you every thing up front. The flowers came from California and I live in florida and they arrived packaged very well and fresh! They also bloomed amazing for the day of the wedding!! The Bouqs Co. was one of the best choices for my flowers especially for a DIY bride. They had a great selection but I went with a specific color pattern that matched my theme. They arrived in a nice box with instructions on how to care for them till the big day. I was able to then arrange them how I wanted and had plenty left over to place on my tables and decorations. After the wedding, I was able to press them and have them as a keepsake. It was a great investment! I am NOT an artistic person and was totally lost when it came to flowers for my wedding. After getting quotes from local florists, I was a bit shell-shocked at the cost of wedding flowers! When I asked for a quote from Bouqs I almost hit the floor from surprise at how much LESS it was. I worked with Aimee via email and she made the process so easy. I was totally baffled but she pried my tastes out of me and made perfect recommendations. I went with the DIY Passion collection and Aimee customized the order to match the number and look of centerpieces I wanted. She also adapted the color palette perfectly to match our theme. The flowers arrived a couple days before the wedding and I only had four flowers out of hundreds that we couldn't use. The rest perked up quickly in water. Since it was DIY, my bridesmaids and I had a little flower session. Bouqs provides "recipes" and videos on how to assemble everything and it went SO much better than I thought it would! And it was a little fun bonding time with my ladies. So if you have a little time to spare and want to save SO much money, I would totally recommend this! Excellent choice! Gorgeous flowers, great price! Bouqs was such a fantastic value, I literally saved thousands of dollars going with them instead of a florist. I went with the Cherish DIY package and it was actually relatively easy to assemble. The one thing I would recommend to all brides is really take the time to read through all the material they send you and ask all your questions up front. Samantha and Aimee were super helpful and patient walking me through it all. They will let you know up front any risks that may happen and the solutions they have. Fortunately we didn't hit any bumps but I appreciated them being up front. We received so many compliments on our flowers and it was extra special to be able to say that I put them together with my bridesmaids. Everyone thought a florist had done them! I was nervous hiring floral vendor across the country. 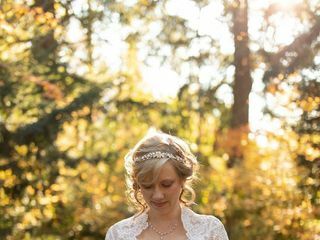 But the reviews and their website did not disappoint me on my wedding day! The quality of my flowers, on-time delivery to my wedding site, and the quantity of extra flowers was Spectacular!!! I know how expensive wedding flowers can be, The Bouqs saved me money and gave me piece of mind with my color scheme and wedding day vision. I highly recommend this company for flowers if you are on a tight budget and would like beautiful flowers. The flowers we selected came exactly as expected and on time. We had to trim all the bouquets for the vases they went in but we were happy to do that for the money we saved by going this route. It’s been a week and a half since they were delivered and they are still looking pretty good! The one thing to consider is the transportation factor the day of your wedding. We had everything in the vases, so we transported them in the vases, but the logistics of making sure everything was secure and getting people to help with the transport was a little tricky. Since the wedding party was getting ready for photos, we had our ushers bring the flowers to our venue and help with placing them on each table. Overall a great company to work with and they make it very easy! After searching for a sustainable (and affordable) flower option for my wedding this past July, I was watching a Shark Tank re-run and saw a follow-up on the The Bouqs Company. The company was everything I was looking for, and when I checked out the website, I was surprised to find the flowers of my dreams for only $300! Not only did this cover my bridal bouquet, but it also included my bridesmaids bouquet and six other pieces for our mothers and groomsmen. 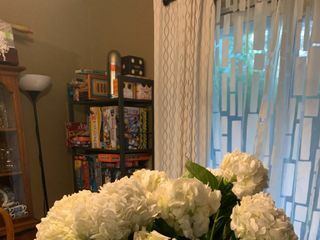 Even with the good reviews on WeddingWire, we were a bit concerned that ordering flowers on the mail would not work, so our backup plan was Sam's club if things didn't go as expected. My mother-in-law even tried shopping around locally for a similarly colored bouquet, and she could not find anything close to what I ordered. Ultimately, our concerns were unwarranted; the flowers arrived fresh and looked exactly like they did on the website. I could not have found pre-packaged flowers locally for this great price, and no-one would have guessed that I ordered my flowers online. Ordering from Bouqs was (believe it or not) the least stressful part of our wedding! I sent them a screenshot of what I was looking for, and they put together the recommended stem counts + colors. The whole thing was done over email and was so easy. We got the DIY package in the Original package size. 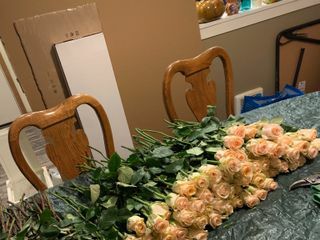 There was enough for 1 bridal bouquet, 5 bridesmaid bouquets, 9 boutineers, and 18 centerpieces (our vases were a bit smaller than what they recommended). All-in, we spent about $900 on flowers for a 120-person wedding - you can't beat that. Our flowers arrived on Wednesday for our Saturday wedding - they did look a little sad at first but opened up overnight BEAUTIFULLY! We prepped the centerpieces and bouquets on Thursday, and left some extra stems to do boutineers on Saturday. It took 4 of us about 2 hours to de-stem and create the bouquets and centerpieces. We had fun! I would also recommend watching Bouq's youtube videos on how to do the arrangements - they were quite helpful. My best advice for DIY flowers is to make sure you have the right tools for the job (i.e. 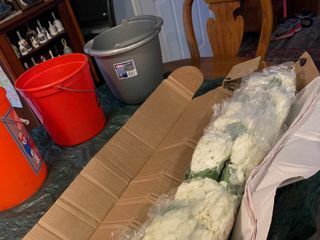 thorn strippers, cutting shears, and floral tape), and the logistics locked down - transporting ~20 fragile centerpieces with water can be somewhat of a challenge. We were able to buy big totes and our coordinator picked them up the day of the wedding. Overall, if you don't mind being putting in a little work, Bouqs is the BEST option for beautiful, cost-friendly wedding flowers. Can't recommend them enough! I had a great experience working with Bouqs.com! I used their flowers for my reception and they turned out absolutely beautiful. We mainly communicated over email and they were always very quick to respond. I would definitely recommend them! I actually won a wedding package through Bouqs co. through a sweepstakes, and I never would have taken the "risk" of doing online wedding flowers if it hadn't been free. However, I can't recommend them enough! We had beautiful flowers at a small fraction of the price it would have been to have a local florist do it. The flowers surprisingly arrived in super good condition despite the hot Tennessee summer they traveled in, and they held up about as well as I would have expected of any flowers at our outdoor wedding. 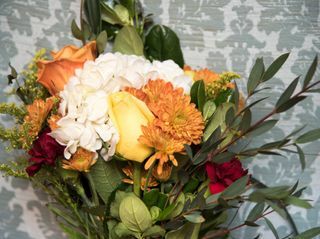 If you are looking for a simple but beautiful arrangement, consider Bouqs! Just keep in mind that, unlike with a traditional florist, you or your wedding planner will be responsible for finding vases and transporting the flowers to the venue on the day. Caitlin was amazing! My flowers ended up getting delayed by Fedex screw-ups and Caitlin was right on top of it. She was more help than what fedex was finding my flowers. Very good experience. Very easy to order and flowers arrived on time. Flowers were beautiful. A few buds from my bouquet broke in transit, but they try to account for this. This is a great option for a low key bride. I made my bouquet, my two bridesmaid's bouquets, my husband's boutonniere, and our floral accents all with the wholesale package from The Bouqs. They were amazing to work with, and the flowers looked amazing! The Bouqs Co was absolutely AMAZING! It was super simple placing my order for a prearranged package. Everything came in exactly as described 2 days prior to my wedding. The packaging was made-to-order so everything was in perfect condition. The only thing we had to do was trim the stems and put them in water. The bouquets, centerpieces, corsages, etc. were so beautiful for my wedding. The only downside I can see is that communication is pretty much limited to email and when you’re a nervous bride, sometimes you want to hear an actual voice. Nonetheless, I would recommend The Bouqs Co as a much less expensive alternative to your local florist and you definitely will not be disappointed! 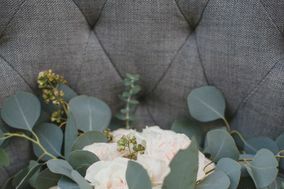 Early on in my wedding planning process, I realized I would most likely need to do silk flowers for my wedding because real flowers/florists in my area just didn't fit in our budget. Then, I stumbled upon The Bouqs Co. and thought I may just be able to have real flowers after all! Samantha helped plan my order - she helped decide what package would be best and what add ons would help, in addition to what flower colors would work best with our wedding colors. Samantha was super responsive in the entire planning and ordering process. A few weeks before the wedding, Aimee reached out to confirm my order and give me care instructions. Both Aimee and Samantha were very helpful in answering the many questions I had (I do not have a green thumb and know nothing about flowers). We received the tracking information the Tuesday before the Saturday wedding. The tracking information was very helpful and even gave us a time estimate to the delivery which was great. The flowers were delivered on the Thursday before the wedding. I would definitely recommend having help to cut, dethorn, and arrange the flowers (it was just me and my mom so it took quite a while). But the instructions were straightforward, so it wasn't difficult, just time consuming. We did have an issue with our order -- we received the wrong colored rose petals. I contacted Aimee as soon as we noticed and her response was immediate. We had new flowers delivered the next day. Would definitely recommend The Bouqs Co. for a more affordable option for real flowers at your wedding! Absolutely loved working with the entire Bouqs team. They were so easy to communicate with and our flowers were amazing! They explained everything ahead of time and provided videos, therefore it was super simple to execute. It was obviously a lot of work to put together the centerpieces and bouquets, but honestly it was so much fun to do with my bridesmaids and how many brides can say they put together their bouquet! The extra work is so worth it when you think of how much money you save by purchasing from the Bouqs. Definitely recommend them to anyone who isn't afraid of a little DIY. The only hiccup that we had was that 1/2 of our flowers were delivered a day late, but Fedex was super helpful and gave us updated tracking info to assure us that they would arrive the next day which they did (which was still 2 days before the wedding) and the Bouqs representative was also reassurring. All in all, the flowers were absolutely beautiful! I have been one of Bouqs biggest fans - sending flowers to friends, family, colleagues, etc. for several yrs. After getting sticker shock from florists for my wedding in the (rural) White Mountains of NH, I turned to Bouqs. Despite my hesitation, this was one of the best decisions I made for my wedding on 9/30/17. Samantha was so patient and kind with me. I must have sent a couple dozen photos trying to get the "right" bouquet. The flowers arrived perfectly scheduled on 9/27/17 and with proper watering and storage, bloomed beautifully for our wedding on 9/30. 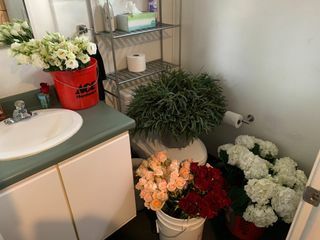 (Brides - please do waste unnecessary energy worrying when the flowers arrive and look "limp" - they traveled far ... in boxes without water...) I emailed Aimee at Bouqs who called with reassurance after looking at the pics I sent of the snapdragons. They just needed water & a few hours to perk back up. Thanks again, Aimee! My close friends & family enjoyed putting the bouquets together. It was a very relaxing activity that we could all enjoy while bonding with each other. It took us approx 4 hours to do 10 centerpieces & 2 bouquets. The 6 boutonnieres took 1 hr the morning of the ceremony (with 2 people working on them). I've attached a photo of my bridal bouquet and one of the centerpieces at our reception in Sugar Hill, NH. Look at how beautiful these turned out!!! I can still smell their wonderful scent in my mind! I'm also attaching a one week post-wedding photo to show that these flowers are not only gorgeous, but also so hardy - thanks to the beautiful farms & farmers in Colombia and Ecuador! 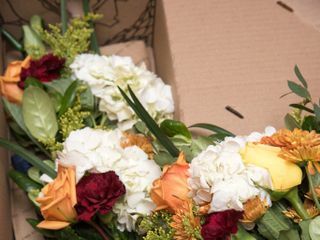 This one week post-wedding photo is a testament to how fresh and amazing Bouqs flowers are - they're in perfect shape and could take another trip down the aisle! These flowers last - so don't be concerned about a Wednesday arrival for a Saturday wedding - your flowers will last! Bouqs knows what they're doing! I loved all of the flowers that came. They were nice and fresh. The only thing I was concerned about was them showing up on Wednesday and being old for the Saturday wedding. I shouldn't have worried because they looked amazing by the day of! I had many compliments for them and people had no idea that I had put together the centerpieces and bouquets with my bridal party the day before! Bouqs for weddings is amazing! I have been a customer for years for ordering flowers for birthdays, Mother's Day, etc. but was initially nervous about the idea of ordering flowers in bulk for our wedding. I am so glad we did! We saved SO much money on a traditional florist and our guests commented that they were the most beautiful flowers they had seen at a wedding. Meghann was great to work with. She was really responsive with flower selection, recommendations, and pricing. Delivery was seamless, and the flowers were perfect. We had our day of coordinator who also designs events put together the actual arrangements and receive the delivery - which I would recommend doing if you have someone who feels comfortable working with flowers who you can hire. Use Bouqs for your wedding flowers - you won't regret it! I will admit that I was nervous about the whole getting flowers shipped to me a couple days before my wedding and praying that they looked good and matched what I was expecting. I was not disappointed one bit but rather my expectations were exceeded. The flowers were beautiful! I received so many compliments on my bouquets and centerpieces and I couldn't have asked for better service!